Ready for business? About one-third of Indian River's BPA students earned spots to the national conference in California in May. One day, these kids could make great business employees — or executives. 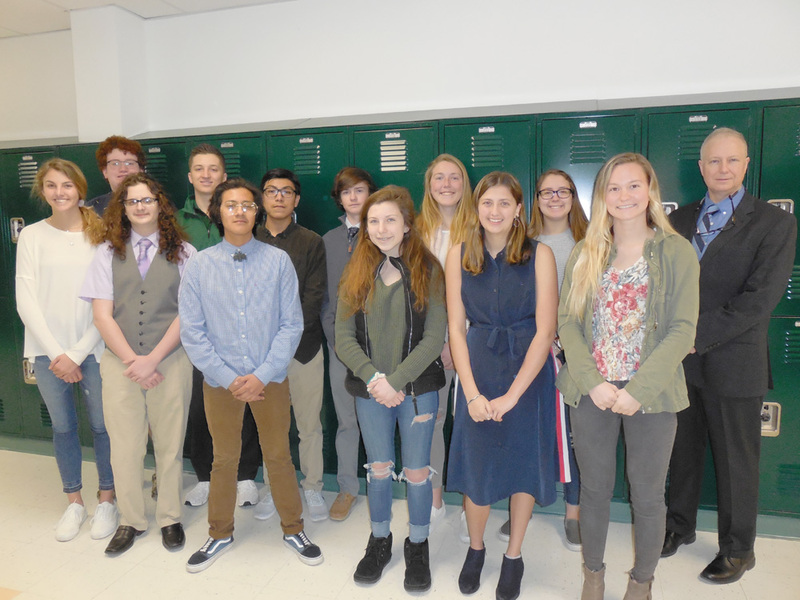 This year, a bunch of Indian River High School students have qualified for the Business Professionals of America (BPA) National Leadership Conference, May 1-5 in Anaheim, Calif.
Students who earned competition spots for 2019 were: Morgan Bomhardt, Isaac Chandler, Gavin Clattenburg, Kayla Harant, Misty Hickman, Jabes Lopez, Josue Lopez, Sarah Roehl, Dane Shuart, Kate Timmons and Brooke Weaver. IRHS also has four of the nation’s 42 BPA Torch Award Ambassadors, akin to an honor society: Chandler, Timmons, Luke Morgan and Weaver. Staff advisors were IR teachers Jeff Bunting and Steve Kilby. Students are now seeking sponsorships and donations from the community to help with the costs of attending the national conference. It’ll cost nearly $13,000 to send IR’s delegation across the country. They’re also raffling off a new 13-inch Apple MacBook Pro, with raffle tickets costing $10 each. Entries can be purchased through BPA students or online at http://bit.ly/2YcvHJQ. The MacBook drawing will be Saturday, April 20, before Easter. “They did that on their own,” Bunting said. “When you’re at the national level, it’s not just about representing your school, it’s about representing the state,” said Josue Lopez. Because IRSD routinely sends about 10 kids to nationals, they fundraise intensely all year, from the annual golf tournament to selling granola bars between classes. BPA is special because “It takes what students live in the classroom … and gives them the opportunity to apply those skill sets through experiential learning. It’s directly relevant to the workplace,” from finance to personal and professional ethics, banking, technology support, said Bunting. The gold-winning Video Production team included Kayla Harant, Jabes Lopez, Josue Lopez and Dane Shuart. This year, they had to create an infomercial for BPA, which featured interviews from students and even past BPA members. Besides the video itself, the students scored so high because of their presentation and judges’ interview. Both their filmmaking and their own presentation skills improved as they also learned new software, designed storyboards and memorized the information. Gavin Clattenburg again earned first place in Extemporaneous Speech, in which contestants only have a few minutes to prepare a speech on an assigned topic. Knowledge of the topic definitely helps, but confidence and good story-telling can save the day. Brooke Weaver and Morgan Bomhardt won first and second in Legal Office Procedures. This tests multiple fields, including civil and family law. Students must think like a paralegal in multiple choice, writing a letter, preparing an affidavit and an interrogatory. Kate Timmons won second place for Medical Office Procedures. This tested her knowledge of the business side of a doctor’s office, such as Medicaid, Medicare and private insurance billing, some diagnoses, anatomy and physiology. She brought knowledge from past health courses at IR. The test competitions demand knowledge, but also the nit-picky formatting of their particular documents, down to the spacing of a Word document. Sarah Roehl won fourth place in Advanced Accounting and fifth place in Payroll Accounting. At IR, her finance knowledge is expanding beyond the typical to include corporate, retail, credit, taxation and more. “I absolutely love accounting. It’s my passion; it’s what I want to do with my life,” said Roehl, a senior who also passed her QuickBooks certification earlier that day. Isaac Chandler earned sixth place in PC Troubleshooting & Repair, which basically prepares him for IT support, managing printers and computers. He joined BPA in middle school and has come to really enjoy the tech competitions. “I didn’t know much about computers. Now I want to go to college for it,” Chandler said. Misty Hickman earned sixth place in Personal Financial Management. As a freshman, she used much of her Intro classwork in the test. It’s the kind of real-world knowledge that many adults don’t even know, such as retirement, taxes, checking and the best options for stock market investment. “I got to apply it in those real-life scenarios … seeing how this would be involved in real life and making sense of why we have to budget,” Hickman said. Bunting commended all the students’ hard work and determination, fit around already busy schedules. The national conference is the culmination of a year’s worth of work and fundraising. There’s competition, workshops, certifications, pin trading, cultural experiences and networking with potential future corporate employers. “Everyone should join BPA,” Josue Lopez said. “We’re basically the future,” Jabes Lopez added. IRHS sent 29 students to the State Leadership Conference in Dover in February. Chapter officers Luke Morgan, Brooke Weaver and Morgan Bomhardt also cast votes for the 2019-2020 state officers. Also honored with Delaware Torch Awards at the Diplomat level were Alexa Fitz, Kate Timmons and Colby Willey. Statesman level winners were Isaac Chandler, Misty Hickman, Luke Morgan and Brooke Weaver.